9 Story Media Group is pleased to announce that it has secured multiple international sales for the animated comedy 3 AMIGONAUTS (52 x 11’), aimed at children 6 to 11 years old. New licenses include Sony Pictures Television Networks (UK, Italy and Sub Saharan Africa), Canal+ (French-speaking Europe and Africa), RTP (Portugal), Disney (CEE), DKids (MENA) and Zoom (Israel). The series premiered in August 2017 on YTV in Canada. 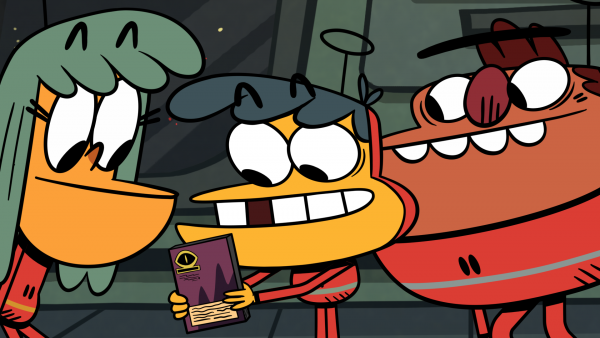 Created by award-winning director Kyle Marshall (The Loud House) and directed by Mike Geiger (Winston Steinburger and Sir Dudley Ding Dong), 3 AMIGONAUTS is produced by 9 Story Media Group for YTV. 9 Story Distribution International is handling international distribution and consumer products. Set in Earth’s far-flung future, 3 AMIGONAUTS follows three lovable but reckless pals, Herby, Kirbie and Burt, who are mistakenly accepted at the universe’s most prestigious space academy. In their quest to fit in, these goofball friends super-size the smallest tasks into madcap intergalactic adventures. Sony Pictures Television (SPT) (http://www.sonypicturestelevision.com), a Sony Pictures Entertainment company, is one of the television industry’s leading content providers, producing and distributing programming in every genre around the world and for a multitude of platforms. Since its launch in the UK TV market in 2011, its portfolio has grown to become one of the top multichannel players in the country, owning and operating 16 channels in total, and reaching a combined total of more than 22 million viewers per month. The SPT UK channel brands include Sony Channel, Sony Movie Channel, Movies4Men and global anime VOD service, ANIMAX. Following the 2014 acquisition of CSC Media, SPT grew its slate further, to include an additional 14 channels in the kids, music and general entertainment space, including brands such as True Entertainment, Tiny Pop and Chart Show TV. Operating across the Sky, Virgin, Freeview and Freesat platforms, SPT UK boasts a current programming slate that includes top-rated daytime dramas, landmark series, critically acclaimed primetime dramas, comedies and films. This entry was posted on Wednesday, October 11th, 2017 at 2:45 pm	and is filed under News. You can follow any responses to this entry through the RSS 2.0 feed.